A brief overview of the game, its theme and gameplay. 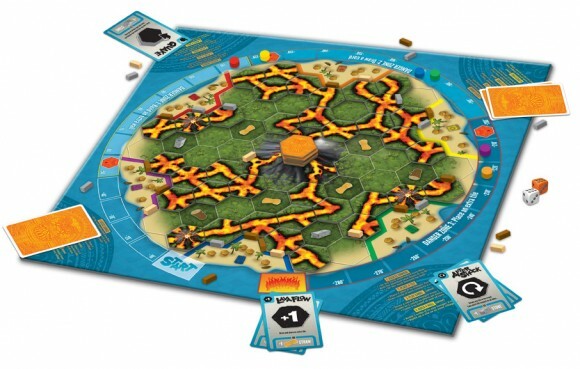 To hold back the lava, players can build walls of various materials or play cards to rotate, replace, and remove lava tiles as well as cool down and fortify their own villages. 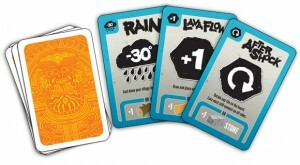 After the volcano has finished erupting, the player whose village is at the lowest temperature wins! Eruption is a great gateway game. It has familiar elements like dice rolling, as well as bright colors and friendly art, that attract non-gamers, but it introduces concepts such as tile laying and strategic choice. It also has a lot of balancing mechanics so that no one gets left behind. I’ve found, in introducing it, that it works really well because things happen in sort of unnofficial “phases” that other players can see and teach. Here’s usually how it goes; new players decide that I, the teacher, must be ridiculously good at the game, so they all immediately target me with lava. So initially, I fall behind. But then I reach the next danger level quickly, so all the players see the powerful benefits of being the first to access a new ability as well as place the eruption tile. It also gives me the chance to access a wider variety of cards, and then use them strategically. This allows the new players to see examples of how the cards can be used – but instead of me pulling ridiculously far ahead to do so, it’s me catching up to everyone else (and evening out some of the overwhelming lava flows.) After that the players start to realize that they need to spread out the lava, earn cards for themselves, and build walls strategically. The higher the danger level, the more you can do in a single turn – often when you get up to the 3rd danger level you can take long turns and play 10-15 cards by placing and rotating tiles to gain new cards, so the complication escalates – but it flows pretty well since turns start off simple, and players get to learn things little by little. It’s an “attacking” game in a sense but it doesn’t lead to a lot of spite since the point is to attack everyone all the time. Ganging up on someone usually just leaves them in a powerful position with lots of abilities and cards to play. The game only lasts about 45min-1hr. It’s strategic enough to be fun for a gamer, but light enough for newbies to participate and even win. You’ll never be able to pull too far ahead, but your choices do matter and can make that 10 degree difference for the win. 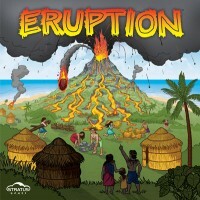 I was drawn to Eruption by its premise — each player owns a village on an island with an exploding volcano. Your goal is to do your best to keep as much of the lava off your village as possible. On your turn you place a lava tile. This is one of my favorite parts of the game. You must keep the flow going, but you must choose whether to drive the lava into your opponents’ villages or turn the lava approaching your village the other way around. Then, you play cards and build walls. The turns flow somewhat awkwardly. As your village heats up, you are able to draw cards, more cards, and have other rule changes. It’s a bit weird to keep track of and isn’t terribly intuitive. Another problem is that initially you have cards, but don’t get to draw new ones until midway through the game. Cards play a somewhat awkward role because of this. I felt they could have been better integrated. Many of the cards don’t seem terribly useful, or only useful in very specific situations, so often they are discarded to obtain materials for walls, which is the other use of cards. As the game progresses and villages heat up, there are some huge, heavy handed catch up mechanics. Because of this, every game I’ve played of Eruption ends with all of us on the maximum heat level. It requires the tie breaker to determine the winner and that isn’t much fun. Overall, this is a mostly good game with some strange or rough spots. I feel more could have been done with the lava tile laying mechanic and to better integrate the cards. Add a Review for "Eruption"